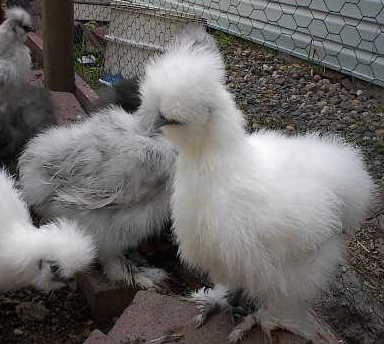 Silkies are one of the oldest, most beautiful and unique breed of bantam chickens. They look much like animated powder puffs, as they scratch around in my yard. And upon seeing them, people always exclaim, oh, they are so adorable! And that they are. But Silkies also have a very interesting history. Ornithology, which he described as, white as snow, with wool like sheep. Because of their unusual feathers, it was even rumored back then that they may be a cross between a rabbit and a chicken, and they were even called rabbit-fowl. Suffice to say, that rumor was untrue. But that Silkies are an unusual, beautiful breed, is very true. Silkie bantam chickens are an affectionate, docile and trustful breed. They have dark blue or black skin, and feathers without the usual forms of webs. Because the feathers lack of adhesion of the barbs, they look like down or silky hair, giving the appearance of a rabbit or angora cat. Another feature that is beautiful and unusual on silkies are their turquoise blue ear lobes, and on their feet, they sport five toes. They also have mulberry colored faces, blue legs and skin, similar to game birds, an attractive rose colored comb, large dark eyes, and a beautiful, small round topknot on top of their heads. 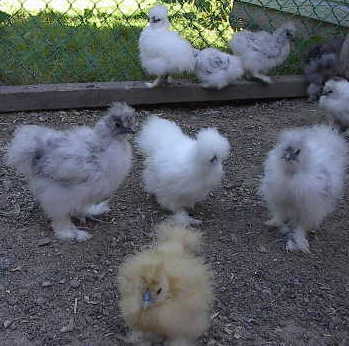 Silkies come in white, black, brown, buff and partridge colors, and in bearded and non-bearded varieties. 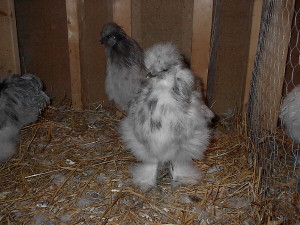 Since silkies dont have usual feathers, they cannot fly at all, like some other chickens, so they are easily contained, and wont venture very far if kept in the yard. And because of their docile nature, they make ideal pets for children in the country. Silkies are great layers of fairly large sized bantam eggs, and will lay well into winter, when other breeds of chickens have quit. In fact, winters dont bother Silkies much, because their fluffy down coats, keep them warm. Silkies are quite affectionate towards their owner, and realize that we will not harm them. They will talk to you with their little, chicken clucks, and can be made so tame, that they will fly up into your lap if given the chance. Silkie bantam chickens are the best sitters in the world. A Silkie mother will never abandon her eggs, and will be a protective guardian of her babies. In my yard, should a dog or cat venture too close to a mother hen with her chicks, it will soon run for safety, for a Silkie mother will fly at it fiercely, flapping her wings and screeching at the intruder, menacingly! Silkies are a long-lived chicken, and stay beautiful, even when older. 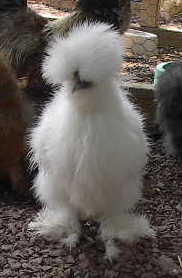 I have one Silkie hen that is now 8 years old, and she is still laying and is a pretty as she was in her poulet stage. Poulets, in case you dont know, are the teenagers of the chicken world. In the past, Silkies were used to hatch out game birds, because of their wonderful sitting and mothering abilities. But since the use of incubators became popular, they have lost their status as the best sitters. These days, theyre mostly raised for show, and you will often find them in petting zoos, where their sweet, docile nature, and fluffy covering, delight children of all ages.